One of the market segments that AMD has not yet established a meaningful presence in with its Ryzen processors is the ultra-compact form-factor (UCFF) PC market. AMD's limited progress here comes despite the fact that the company introduced suitable low-power Ryzen APUs for desktops a while ago. However things have finally begun to change as of late, after a number of PC makers introduced miniature systems featuring Ryzen chips. One of these companies is ECS, which announced its miniature SF110-A320 PC at CES. Measuring 205×176×33 mm, the ECS SF110-A320 is based on AMD’s 35W quad-core Ryzen desktop processors with Radeon Vega graphics, and is paired with AMD’s A320 chipset. The APUs will be paired with two DDR4-2400 SO-DIMMs and an M.2-2280 slot for a PCIe or SATA SSD. 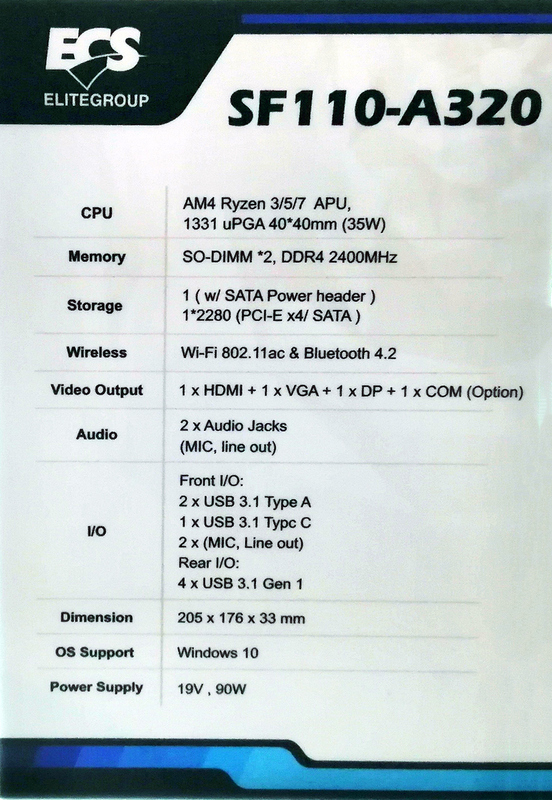 The system will be equipped with a 90 W PSU, which is more than enough to feed an APU, memory, SSD, and various USB peripherals. 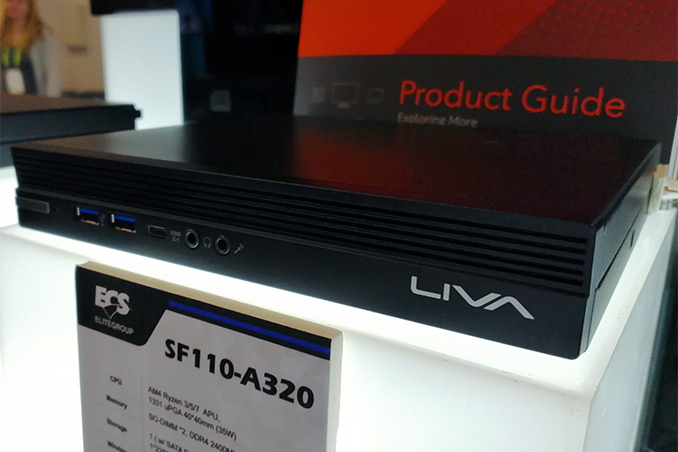 Connectivity-wise, the SF110-A320 UCFF PC offers an essential set of physical and wireless interfaces, including an 802.11ac Wi-Fi + Bluetooth controller, a GbE, three display outputs (DisplayPort, D-Sub, and HDMI), one USB 3.1 Type-C port, and six USB 3.1 Type-A ports. While ECS demonstrated its SF110-A320 at CES 2019, the company has not revealed much information about its positioning. On the one hand, the system lacks has GbE, which is crucial for offices, but is not that important for living room HTPCs. On the other hand, the latter tend to feature hard drives in a bid to keep certain content locally without using expensive high-capacity SSDs. Keeping in mind that the product is an early prototype, ECS does have time to tweak their design if necessary. Either that, or it has a potential expansion market in digital signage. UPDATE 1/25: ECS has informed us that the system indeed has a GbE port. Without any doubts, there is a growing interest in AMD Ryzen processors across all market segments, especially given the success of the desktop platform. So it is not surprising that companies like ECS are announcing UCFF systems featuring Ryzen APUs. In the coming months we will see more compact PCs powered by AMD’s latest APUs and CPUs. I'm guessing "yes", as the comment was more about HTPC's in general, not whether it was Intel or AMD-powered. Limited by DDR4 2400Mhz memory is sad to see. 38.4GB/s of bandwidth just isn't enough for the CPU+1080P gaming. Funny when they raise memory module speed (MT/s), they also raise CAS latency (slower timing). Which means the DDR4-2400 CAS 16 here would be 21% slower than my 8 years-old DDR3-1333 CAS 7.